Book App Narration – Big Bad Wolf or Fairy Godmother? This month, the ReadItDaddy blog has launched a great campaign to encourage mums and dads across the UK to read aloud to their children – Read It Mummies and Daddies 2013. I was really keen to support this initiative, but wondered how to tie it in with book apps. We love books in print and read them aloud together most days, especially as my children are not yet able to read them for themselves. But – confession time! – when it comes to sharing book apps, after the first few readings I quite often stick to the “Read to Me” option and let the children get on with it. It’s pretty useful while I get on with dinner or sort out the mounds of unpaired socks in the laundry. So this campaign made me stop and think: Should I be turning off the narration and reading the story to my children? My first thought was that this could be pretty challenging, as the text in apps can be quite non-linear, depending on how you interact with it. 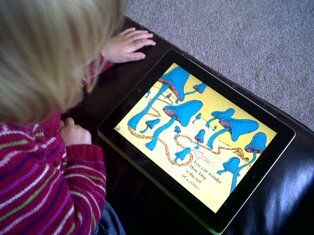 But in using the iPad as a babysitter with trusted apps, I’ve neglected the experience of sharing the story. I started to wonder whether I was actually using book apps in a negative way, even if narration has become the norm over the past couple of years. As soon as I read this, I felt much happier about my use of narration. Immediately apps with stand out voices came to mind, such as Samuel West narrating The Book of Moomintroll, Mymble and Little My, Eric Jacobson in The Monster at the End of This Book, or the child narrators in Nosy Crow’s apps including Cinderella. What defines excellent book app narration? For me, it is firstly creating the right atmosphere to match the story. Samuel West evokes the eerie fairytale nature of the Moomins’ world, while Eric Jacobson builds up the excitement and over-the-top silliness in The Monster at the End of this Book. The child narrators in Nosy Crow’s apps have an extra special role, in acting as peer models for children who see that reading aloud isn’t just for grown-ups! Secondly, the best book apps encourage you to take your time and pour over the pages like a “real” book. Excellent narration can help to pace the story and direct the reader’s attention. If the narration isn’t strong, my children are more likely to ignore it and press randomly on the page to see what interactivity they can find. Listening to others read the story can give you more confidence in where to pause, which words to emphasise and how to use your voice as part of the overall picture. Since purchasing The Book of Moomintroll, Mymble and Little My we have also been given the print version as a gift. I am sure I have been influenced by the wonderful tones of Samuel West when I read it myself. What do you think – do you always use the narration option, or read book apps aloud to your children? We don’t actually use the narration options that often, but we don’t necessarily substitute it with me reading aloud either. As you say, a lot of the time the text is non-linear and C and H capitalise on any opportunity to go ‘off-piste’ and interact with the app on their own terms so we rarely actually read an app like a story. This may be to do with the age of my boys (three and half and nearly two) or may be simply down to their personal preferences. They’ll both sit quite happily and engage for a while with a print book (with me or by themselves, though obviously neither of them can read yet) but less so with a book app, though increasingly C is showing more of an interest in this. The times when they will sit for longer and use a book app are always when I sit with them and read the story. I’ll be very interested to see how their preferences change as they get older and learn to read (and perhaps once we have an iPad rather than just an iPod Touch / iPhone 😉 ). Brilliant and thought-provoking stuff Helen! We have used the narration mode in some e-books – usually if they’re really good books with high production values we’ll do it to check out how well ‘read’ they are. It’s also great if C doesn’t fancy listening to Daddy making up silly voices or over-dramatizing stuff 🙂 I rather like the MeBooks approach, where you get the best of both worlds. If you’ve got the time, the app lets you sneak off and record your own voice reading the story, adding your own dialogue and if you’re up to it, adding sound effects even! 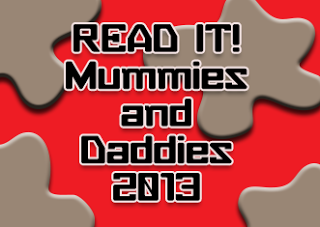 So grateful for your post in support of #readitmummiesanddaddies2013, superb stuff! Thanks for both these really interesting comments! So interested to see that you usually go “off piste” with apps @storyseekersuk, and the point about being able to record your own narration is a really good one @readitdaddy. Great way to personalise it & have the best of both worlds.